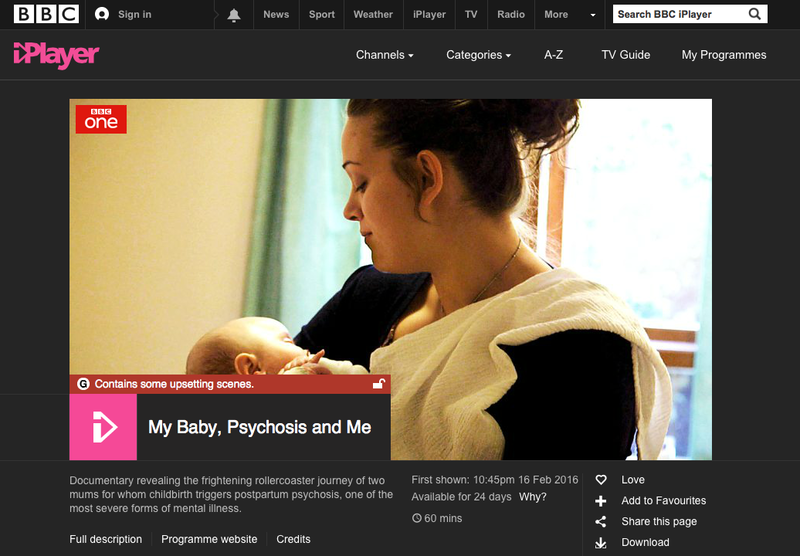 Michelle Cree reflects on BBC One’s 'My Baby, Psychosis, and Me', part of the 'In the Mind' series. This programme followed two women admitted to Winchester Mother and Baby Unit with a diagnosis of Postpartum Psychosis (PP). Hannah, a nurse, was admitted on a section with her baby Esther 12 weeks after she was born. Hannah was experiencing suicidal thoughts and delusions that she was God. Jenny, an artist, was admitted with six week old baby Libby. She had a previous diagnosis of bipolar disorder and had carefully planned her psychiatric treatment in case of a relapse. She came in voluntarily. She has a son Reuben (now two years old) and became unwell after his birth, but this was managed by an increase in medication and community psychiatric care. Jenny was experiencing mania, with racing thoughts and difficulty sleeping. Both women had pre-existing bipolar disorder. Although it is still not clear what causes PP, this programme reflects the prevailing view that in many cases it is related to bipolar disorder which begins, or is triggered into a serious episode, by the rapid drop in hormones following the birth of the baby. The chances of women experiencing PP if they have bipolar disorder or a previous postpartum psychosis is high; one in every two women. The risk is elevated if there is a close female relative such as mother or sister with bipolar disorder or PP, suggesting a genetic link. The care from the perinatal mental health team reflected the level of skill, training and experience needed to care for a seriously ill woman alongside her baby. What wasn’t shown was that there would also have been a number of other ill women and their babies all requiring the same level of care and compassion evident in the programme. The programme highlighted the fact that 80 per cent of women across the country do not have access to such care. Both women experienced serious deteriorations in their illness after initial improvements. This was devastating to watch; witnessing the dashing of hope, the fear in their families, and the puzzlement of Dr Alain Gregoire, Lead Consultant Psychiatrist. Jenny eventually had to be admitted to a high secure intensive care unit 100 miles away without her baby. Hannah began experiencing 'dark thoughts' which led her to cut her neck and wrist. As Dr Gregoire said, it is utterly 'gruesome' to watch people experiencing such levels of suffering. Hannah was eventually given a course of ECT. Both women recovered following these intensive treatments, however it is unusual for women with postpartum psychosis to experience such severe relapses; most are well into recovery after about six weeks. What shone through in the programme was that despite the severity of their illness, both women maintained a strong focus on their baby. Their deep love and connection to their baby was evident. Their care was tender and sensitive, no matter what was going on in their mind at that moment. This was demonstrated in the video clip taken of Jenny interacting with Libby, powerfully countering her own pessimistic prediction of her mothering. This highlighted how crucial it is to keep mother and baby together unless, as in Jenny’s case, it becomes temporarily impossible to do. Jenny’s move to the secure unit without her baby brought a real focus on another dimension of this illness; the impact on the family. Both women had very loving and supportive partners. Their desperation in watching the women they love become so ill was palpable. Although each woman could be admitted with her baby, it left her partner without new child, a toddler without his mother and baby sister, and partners without their 'rock' and 'soul-mates'. The programme ended at the point when both women recovered sufficiently to be discharged. It could not show, therefore, the sometimes long and difficult journey of recovery. Women often feel exhausted, lose self-confidence in parenting, and describe a sense of being 'shell-shocked'. They are sometimes embarrassed and ashamed about behaviour and thoughts experienced during the manic phase which are so out of character for them. Many will still require the support of their partner and family when they may worry they have 'had enough'. As the woman recovers her partner may 'crash'. This is where a community team step in to provide the support needed to keep recovery robust. Sadly, many women will not have access to such support. - ‘My baby, psychosis and me’ was first shown on BBC1 on 16 February 2016. It is available on the iPlayer. Reviewed by Michelle Cree, the Consultant Clinical Psychologist at the Beeches Perinatal Mental Health Team, Derby, and Author of “The Compassionate Mind Approach to Postnatal Depression: Using Compassion Focused Therapy to enhance mood, confidence and bonding”. I really enjoyed this piece Michelle, it's a very fair and balanced reflection of the content of the programme.